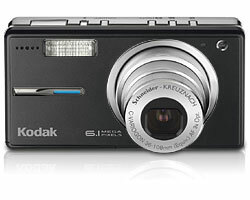 Kodak EasyShare V603 Zoom digital camera is a fit-into-pocket 6.1-megapixel digital camera. V601 features a Schneider-Kreuznach C-Variogon 3X optical zoom lens, a 2.5″ high-resolution LCD display, in-camera picture enhancing features such as KODAK PPERFECT TOUCH technology, multiple color and 22 scene modes including panorama stitch. Beside, Kodak V603 also can records TV-quality video of up to 30 frames per second (fps) on MPEG-4 compression, has built-in image stabilization technology and zoom during video recording and photo taking, plus Kodak Color Science Chip. The camera is available in black or silver. More features, specifications and sample photos at Kodak EasyShare V603 official site (no longer available). DigitalCameraReview reviews Kodak EasyShare V603 and concludes that the Kodak Easyshare V603 is a stylish, capable camera. Kodak has a done a good job of improving the usability of the controls while keeping the camera’s style. Also improved is the operation speed of the camera — with minimal shutter lag and good cycle time. The image quality of the camera is good, with a slight tendency to overexpose. Kodak works pretty hard to make it easy to take pictures, so along with the easy camera operation, it can also plug right into their Easyshare printers to print out your Kodak moments.